Celebrating who our students are as individuals and what they create is at the heart of Meridian’s Art Program. Art is an important subject in any school. It gives students another way to view things and the opportunity to problem solve in a very visual and tactile way. There is no one “right way” to approach a problem in Art. And the process and journey are just as important as the end product. The elements of art and principles of design help to guide Meridian’s art program. Students learn how elements such as line, shape and color can be integrated into their work in a purposeful way. 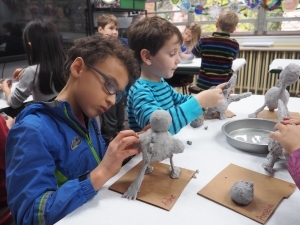 The building block structure of Meridian’s art program enables confidence in students as they work with new materials and mediums and continue to grow their artistic skill set throughout their time at Meridian. For example: in kindergarten students may make a simple slab project with clay. Fifth graders, on the other hand will use their more advanced ceramic skills to create a 3-D “log cabin” out of slab to represent houses built by the first settlers who came to the Americas from Europe. Students also learn how to recognize the elements and principles in famous works of art as they study the masters. Famous artists and their work teach us a lot, not just about specific techniques and styles but a certain time in history and the culture and environment at that time. Throughout each year Meridian students have numerous opportunities to study the importance of art in different cultures and contexts. 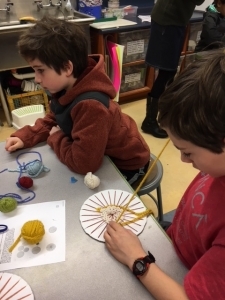 This can be seen in collaborative projects with the Science, Spanish and Music program, as well as through the lens of our Global Studies focus each year. All of these artistic opportunities can be seen and appreciated as you walk the halls of the Meridian School and see student artwork on display. In addition, beginning in spring 2018 there will be a student art show taking place during student led-conference day.